As intelligent, interconnected systems seamlessly support activities along the entire value chain, Industry 4.0 is transforming manufacturing industries across the globe. The opportunities for digital transformation today are undeniable, and the time to act upon them is now. Industry 4.0 adoption is not dependent on technology, but rather on the people who use it. As new technologies transform the workplace, there is an urgent need to take a closer look at the talent agenda. 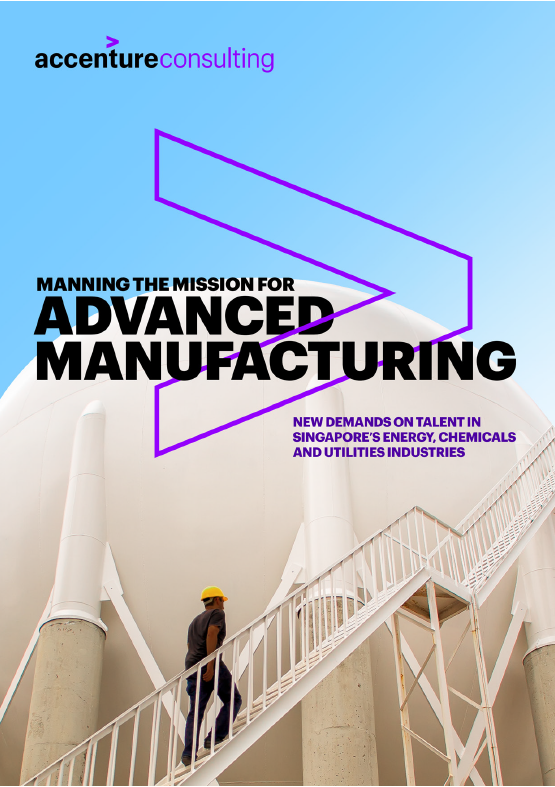 Accenture examines how Singapore’s manufacturing workforce must evolve to unleash its true potential, enrich its experience and pave the way for a sustainable digital transformation. This report is supported by the Singapore Economic Development Board (EDB), Singapore’s lead government agency for planning and executing strategies to enhance the nation’s position as a global business centre. Industry 4.0 is expected to be pervasive by 2020. Global Industry 4.0 developments have rallied companies to a tipping point in the transition from automated to intelligent plants. The next three years will see an increase in the adoption of solutions that include: robotics, big data analytics, artificial intelligence (AI), information and operational technology (IT/OT) convergence, and cyber and operational security. Workforce and organizational requirements are changing to support this transition. To keep pace with technological change, organisations are demanding increased digital literacy and a culture of change readiness across all levels. They highlight an increasing need for a workforce skilled in both core engineering and the application of digital technologies, as well as soft skills to deploy them effectively. The demand for IIoT-ready talent will grow. Organisations will initiate digital transformation by injecting talent and capabilities from solution providers in the short term, while building those capabilities internally over the longer term. A joint industry-government deep dive into identifying the emerging digital skills required. The industry should collaborate closely with government agencies to comprehensively map out the technical skills and corresponding knowledge required across job roles to facilitate Industry 4.0 adoption. Educational institutions and training providers to develop additional programmes and initiatives to nurture cross-trained industrial engineers and technicians with digital skills. As the need for cross-trained engineers with digital skills grows, government agencies, Institutes of Higher Learning (IHLs), Research Institutions (RIs), and solution providers must collaborate and find new ways to deliver cross-functional learning. Examples include assigning research projects with cross-disciplinary requirements, and setting up learning factories outfitted with fully-integrated Industry 4.0-enabled systems. Inclusive planning and clear communication by unions and trade associations and chambers (TACs) to prepare the workforce for digital transition. Unions and TACs must leverage common platforms for collaboration to understand digital developments and support the continued employability of the workforce. Organisations to implement programmatic interventions from shop floor to top floor. At the organisational level, the development of a ‘digital DNA’ conducive to Industry 4.0 adoption depends on initiatives at the leadership, ecosystem, and individual levels. A digital capability development programme by Accenture – 4.0 Applied Now – addresses these perspectives holistically in an applied learning environment. A total of 29 key industry stakeholders were interviewed during the research process. On the demand side, C-suite leadership, plant and human resources managers from 20 manufacturing companies were interviewed. These companies represent 64 percent of Singapore’s manufacturing output in the energy, chemicals and utilities industries. On the supply side, interviews were conducted with five major solution providers in Singapore. Institutes of Higher Learning (IHLs) and government agencies that provide and train talent for the three industries were also consulted. Research by the Committee on the Future Economy (CFE), SkillsFuture Singapore (SSG), and the World Economic Forum (WEF), was leveraged. Finally, a Design Thinking workshop was conducted for the technicians and engineers from the participating organisations to gain an empathetic understanding of motivations, experiences, and needs on the ground.